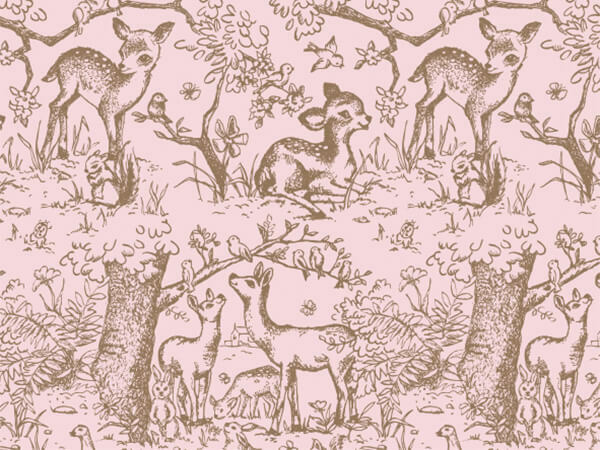 Lullaby Meadow Pink toile features baby animals in a forest scene. Brown design printed on pink tissue paper. Beautiful tissue for baby gifts. Tissue Paper by the 240 sheet bulk ream is printed on 100% recycled paper and part of our Green Way ® Eco Friendly Packaging. Made in the USA. Our Printed Tissue Paper gives a simple bag style, adds pizzazz to boxes or makes a simple wrap by itself. Made in the USA. Make those special occasions a little more fun. Most Special Occasion prints are 100% recycled. All tissue prints contain a minimum of 20% recycled material. Sheets are 20x30".